Saab employs about 4,000 people in Sweden, mainly at its plant in Trollhattan (pictured). Saab's management board will meet again Friday to discuss the troubled carmaker's future amid reports that the company will soon file for protection from creditors. Saab held an extraordinary board meeting on Thursday. The Swedish public service radio reported that the meeting was called to decide on a reorganization of the carmaker. Reorganization is an alternative to an outright bankruptcy filing. The reorganization process includes negotiations with creditors on adjusting the terms of the debts owed by the company. Saab union boss Paul Akerlund, who was at Thursday's meeting, would not disclose what was discussed. “The meeting has been adjourned. I cannot comment on what happened. But I do not think the last chapter in the history of Saab has been written yet," Akerlund told Automotive News Europe. Saab spokesman Eric Geers said the company's management is "extremely engaged" in finding a solution to Saab's problems. "We have a great plan, the only thing that is stopping us is how we can get the right financing in place." On Feb. 17, General Motors said its loss-making Saab unit could file for reorganization as early as the end of the month. GM said it is seeking financial help from Sweden "given the urgency of stemming sizeable cash demands associated with Saab operations." CEO Rick Wagoner said he could not see GM retaining ownership of Saab and the company could be spun off into an independent business from January 1 2010. Wagoner said: "Somebody needs to come in and take over the business in the near term." Saab became a wholly owned subsidiary of GM in 2000. Last year, Saab's global sales fell 25.5 percent to 93,338 units. Industry insiders said there has been a greater interest from outside investors in Saab since GM's announcement that it was looking to offload the brand quickly. The Swedish government has said it is not prepared to take over Saab. Sweden's Industry Minister Maud Olofsson said she was "deeply disappointed” by GM's announcement. "What GM says is that they wash their hands of Saab and drop it into the laps of Swedish taxpayers," Olofsson said. Olofsson said a company reorganization of Saab was "the most realistic path." "This could offer possibilities to develop the parts of Saab that are very good," she said, underlining that such a move was up to GM. "The Swedish state and taxpayers will not own car plants," she added. 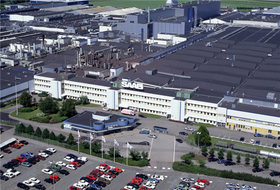 Saab employs about 4,000 people in Sweden, mainly at its plant in Trollhattan.